Be the first to share your favorite memory, photo or story of Elvin. This memorial page is dedicated for family, friends and future generations to celebrate the life of their loved one. Elvin Douglas Johnson peacefully finished his course on Sunday, May 6, 2018 at Westmoreland Rehabilitation Center, Colonial Beach, Virginia. County and graduated from Central High School in 1964. Elvin was baptized and started his walk with the Lord at an early age. He later became a member of Shiloh Baptist Church, Bowling Green, Virginia. In 1968, Elvin began working for InterArms, Inc. in Alexandria, Virginia as a Gunsmith and remained there for 35 years until his retirement. After a couple of years of routing for his beloved Redskins, attending shooting matches, and dancing many nights away. 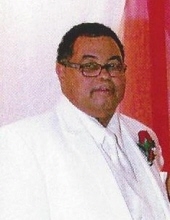 Elvin went back to work for five years as a Transit Driver for Fredericksburg Regional Transit until 2013. For many years, he was a member of the Canadian Club and was an avid motorcycle rider. Elvin loved his family and leaves to cherish precious memories, a loving, faithful and devoted wife Evelyn “Dessie” Johnson of Bowling Green VA; an exceptionally devoted daughter, Lacontas Mechelle Johnson-Thompson (Joey) of Newtown, VA; one son Dame Byrd of Oxon Hill, MD; one grandson Darius Byrd of Oxon, Hill, Md. ; a caring step-son, Tony O. Byrd of Fredericksburg, VA; four step-grandchildren Keyshaun and Alyssa Byrd of Winchester, VA; Faunche and Joe Thompson V of Denver, CO; one uncle Thurman Johnson Sr. of Newtown, VA; five brother-in-laws, Nathaniel Byrd (Christina), Clifford Byrd (Barnita), Gerald Byrd (Constance), Jeffrey Byrd of King George, VA; and Kenneth Byrd (Eunicseia) of Spotsylvania, VA; two sister-in-laws, Gladys Johnson (Frank) and Deborah Cole of Fredericksburg, VA; a host of cousins and friends to include devoted friends Loumell Chapman V, James “Jimmy” Johnson, Floyd Roy, John W. Richards Jr, Mark Monroe, Joseph Saunders Jr. and caregiver Cheryl Johnson. To send flowers or a remembrance gift to the family of Elvin D. Johnson, please visit our Tribute Store. Remains can be viewed two hours prior to service. "Email Address" would like to share the life celebration of Elvin D. Johnson. Click on the "link" to go to share a favorite memory or leave a condolence message for the family.